Posted by Morgan in astroturf, climate bill, Katrina. Hey WaPo: there are some glaring contradictions here. You used this photo precisely because it looks flashy. I mean, it certainly doesn’t relate very closely to the article’s content. Oh, and look at the flashy and hard-hitting RePower America ad at the top of the online post. Big Coal hands out T-shirts while climate activists stop coal blasting using their bodies like at the ongoing tree sit. Big Oil has company management instruct employees to attend ‘rallies’ (company picnics) while 12,000 young people scrape together funds to attend the largest climate conference ever in the US. I risked arrest last week, along with 8 other young people who are motivated by terrible consequences of climate inaction. It wasn’t just for the sake or risking arrest itself, but to make a flashy and bold statement that even the snarky Post couldn’t help but use. Look at more photos here – they’re beautiful. Where are the pictures of those great ‘free lunches’ the coal industry hosts? There aren’t any here because they’re boring pictures of folks who are more interested in a free lunch than climate policy. And yet in this same article, it implies the actions of environmentalists are “sedate”. Big Coal and Oil have the money. We know that. They’re profiting on the destruction of the planet at an accelerating pace, and they have hundreds of millions to throw around to influence politics. We all know that influencing politics means getting your story into the media – that means you. It doesn’t look to good when a lobby effort that spends (how many?) millions on PR and media relations gets a reporter to write exactly what they want. How about this for a story: young people and concerned citizens, fighting a well-funded and well-organized foe, with little help from the fickle mainstream media, use creative and hard-hitting tactics to enact bold climate policy. Sounds like something I want to read about. Posted by Morgan in copenhagen, Katrina, tcktcktck. Saturday’s anniversary of Katrina’s landfall coincides with the 100-day countdown to the much anticipated Copenhagen climate negotiations. “Needless to say, many New Orleanians have placed their hopes in Barack Obama. We see the effects of man-made disaster every day. Climate change is the number one long-term threat to life facing New Orleans.” said Esquizito, a New Orleans jazz and blues performer and Katrina survivor working with the climate advocates. “We’re all waiting for President Obama’s leadership,” he said. Katrina made landfall in southeast Louisiana on August 29th, 2005. 80 percent of New Orleans was under water and at least 1,836 people lost their lives, making it one of the deadliest natural disasters in the history of the United States. 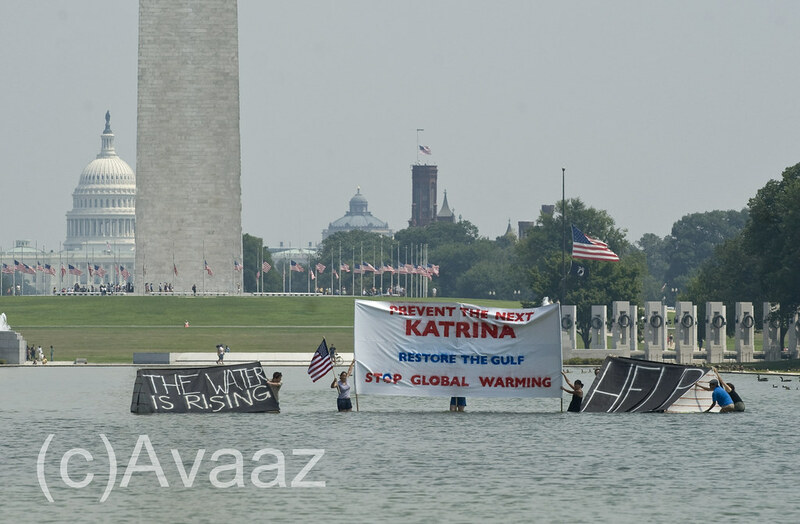 The group of concerned youth called attention to the anniversary of Katrina and the necessity of bold US leadership at the UN climate negotiations in Copenhagen this December to pass a fair, ambitious, and binding global treaty that will prevent environmental disasters of the catastrophic magnitude of Katrina in the future. According to the climate advocates, a fair, ambitious, and binding treaty includes full funding for international adaptation, so that vulnerable areas can adapt to climate threats. Posted by Morgan in Katrina, tcktcktck. Four years ago this Saturday, Hurricane Katrina slammed into the United States, killing at least 1836 people and shaking the foundations of our country. Dr. Kerry Emanuel reports that if Katrina had occurred in 1980, the levees would have held. But global warming increases ocean temperature, increases storm intensity, and threatens America with more super-storms. There’s a lot of talk in the news this week about national security and the risks posed by global warming, both domestically and abroad. In light of a recent typhoon, Taiwan’s military has ranked climate change as its biggest national threat and is re-organizing some military operations accordingly. Pacific island states have upped their call for industrialized nations to act on cutting carbon emissions, saying that the nations least responsible for causing climate change shouldn’t be the first to pay the price. And right here at home, a new study finds that big storms this decade in the Atlantic hit a 1000 year high. None of these things make me feel good, but for people who live in coastal areas, these developments must be downright scary. Security in one’s home is a fundamental human need, one that we’ll fight for and one that we expect our leaders to look out for. President Obama, and congress, do you have our backs on this one? Even if its difficult, can you mobilize the resources available and put us on track to get to 350 parts per million of co2? 1sky.org is calling for climate action in the name of Hurricane Katrina. The Alliance for Affordable Energy in Louisiana is doing phenomenal work on climate and energy issues, inspired in part by Katrina. Take a moment this week to think about what’s really at stake when we talk about stopping global warming. We’re trying to reduce the risk of extreme storms that kill people and destroy homes. There are 104 days until Copenhagen. Lets accelerate the progress and show up at the negotiations ready to fight for our people, for all people.